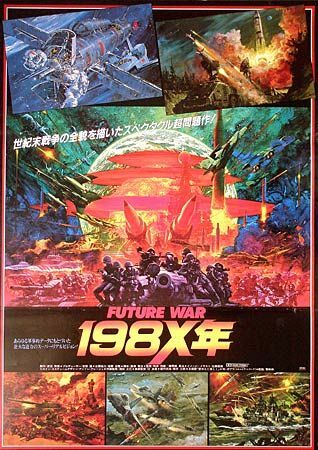 Future War 198X is a 1982 OVA released outside of Japan in 1986, loosely based on The Third World War and directed by Toshio Masuda. The OVA tells of the events leading up to World War III and the characters it most closely affects. Burt, an American scientist, invents the Missile Defense System, making it so the USA no longer feels threatened by nuclear war. The world looks on as his test is successful. His sister and best friend, Laura and Wataru, soon find out that he has been kidnapped by Soviet spies, and after the nuking of the Russian submarine goes terribly wrong, all hell breaks loose. The events of that holiday season are seen through the eyes of the President of the United States; Michael, a British soldier; the team at the Kremlin; and Burt's closest friends. At the time of development, Japanese citizens protested Toei Animation making the film. Such a shattering of the Nuclear Weapons Taboo had never happened. There had been The Last War and The Day After, but nothing that had so thoroughly depicted the politics and graphic aftermath. While a 1982 calendar and a 12 track soundtrack LP were released in Japan, this OVA is incredibly hard to find. Released once on videotape in the two sides of Germany, Italy and Australia, few copies were produced due to the arthouse-filmgoer demographic not being big buyers. The European releases are just hacked up versions of the Australian, which cut 35 minutes. They didn't bother adding credits besides the Japanese ones, adding to the mystery of why Wizard Video released it at all, being a little-known horror film distributor in the first place. Thanks to Wizard Video, the movie hasn't completely faded into obscurity but is getting there. Keep Circulating the Tapes. A detailed rundown can be found here . Not to be confused with the infamous (thanks to Mystery Science Theater 3000) live action film Future War. Compare The Day After, Threads, and When the Wind Blows. Big Red Button: The Minister of Defense ignores orders and presses the large red button, which launches a massive second wave assault. Miami, New York City, Chicago, and Tokyo are all destroyed and from space the earth turns red. Bittersweet Ending: Even though Paris, NYC, Miami, Chicago, Tokyo, and other cities are destroyed and millions have died, the survivors along with the rest of the world band together after the Communist leader is killed. Wataru is returned safely to earth after the remaining Soviet have a change of heart. Bowdlerization: All of the most violent and bloody scenes, plus most scenes of Japan's involvement are edited out of the dub versions. Clingy Jealous Girl: Laura to Wataru. She makes it very obvious when at the disco and he begins dancing with another partner. Convenience Store Gift Shopping: The president sends a box of cigars with a note asking for renewed friendship to Russia's leader for Christmas the day after the accident. While they were expensive cigars, Orloff scoffs and is insulted at the "thoughtless gift", assuming that they are cheap and can be bought conveniently. He brands the president a stupid American cowboy while smoking it anyways. Covers Always Lie: The movie poster depicts so many explosions and things going on that watching a movie that is full of inaction sequences is a bit disappointing. They hired the poster designer that did Godzilla and foreign Star Wars , so that might explain it. Death Wail: The American President upon realizing that all his negotiation efforts failed miserably and there was no stopping what was to come next. Died in Your Arms Tonight: Michael frantically searches for Marina after a fight breaks out in Neinberg, only to find her crushed under the rubble of a building. He pulls her out and she dies in his arms. Dirty Communists: Naturally, since it's an eighties work involving nuclear warfare. Not all of them are evil, but ultimately a few of them are the biggest villains, waiting until the Americans lose their will to fight to try to wipe out an entire half of the world's population. Eagleland: At the disco Laura comments to Wataru that it seems he just can't get into an American pasttime, and he snaps back that the USA's Hot-Blooded and reckless approach to war is causing all of the worlds' problems. Within the movie America is most closely potrayed as type 3. Freak Out: Michael suffers a massive one, triggering the nuclear explosion that causes the Russians to continue the war. New Year Has Come: Before it is announced that Europe has gone to war, Laura and Wataru are enjoying drinks on the balcony in Tokyo while watching the sunset on New Year's Eve, talking about their hopes for the future. A Nuclear Error: The cause of the war. The Americans sent out a sea-based Nuclear Warhead to destroy the boat, thinking that it would be a small enough explosion that it can be blamed on an accident aboard. The result is far more enormous than anticipated, killing everyone aboard and putting the world on guard. Race Against the Clock: Wataru's entire time in outer space, with only one hour of oxygen left and little time to stop the Russians. Rotoscoping: A very impressive sequence of Laura disco dancing at a nightclub after a test of Space Ranger is successful. Sanctuary of Solitude: Much of the world is being shown making their last desperate attempts to beg God for mercy in their churches, synagogues and mosques. Snow Means Death: As the village of Neinberg goes into a murderous rage, a blizzard descends. 20 Minutes into the Future: Presumably that was the idea behind the "X" in the title. Twisted Christmas: The holiday season between Christmas Eve and New Year's Day is the span of the war. War Is Hell: As the president of the USA grimly remarks, "This is a war without victory." Watching the Sunset: On New Year's Eve. While Rome Burns: Michael launches the warhead that destroys millions while heartbrokenly singing "Eidelweiss" and waiting to die. Laura also still sits behind the piano at the jazz bar in Tokyo after hearing that enemy jets are inbound, playing a mournful tune while thinking of Wataru.